A few years back I read about a young lady who was able to get through college debt free, in part because she worked as a soccer ref. I remember feeling so inspired by that and wanting my boys to put their years of soccer playing to good use by reffing for the game. For my first son, Calvin, this was very lucrative. I remember one season he earned $600 by officiating a game just about every day of the week. It has been likewise a pretty good gig for Sam too. But it has been tough going for Gabe. Last fall season (2011), Gabe officiated soccer games for our local CYO athletic department. He got quite a few games and he enjoyed doing them. However, because CYO in Akron and CYO in Cleveland merged their departments and went to some sort of automated system there was a problem with payment. When I got the notice to sign him up on their system, I did so immediately and then we waited for checks to start appearing each week. They never came. Gabe never got paid. Not one single dime. I called up to the Cleveland office and the Akron office, I left messages, I talked to people, and I even called the folks in charge of the automatic pay system and Gabe still never got paid. I estimate that I have around 6 hours of my time invested in trying to get my kid paid for the services he rendered. Somewhere in cyberland between Akron and Cleveland there is $173 for my 16 year old son that he will likely never get unless his father and I appear in person and just demand a check - which might still happen. But still wanting to make some money from reffing for soccer games, Gabe signed up to take the course to become an official Ohio Soccer ref. This entailed me paying about $70 up front and Gabe taking a course online and then attending a one-day program in person culminating in a test. Gabe complied with all of that. After the test had been scored, the powers-that-be called the new refs up one by one to give them their badge. The kids still sitting there at the end were the ones that apparently did not pass - and Gabe was one of these. They told them they could take the course again at no charge. Gabe asked what his score was but they wouldn't tell him. 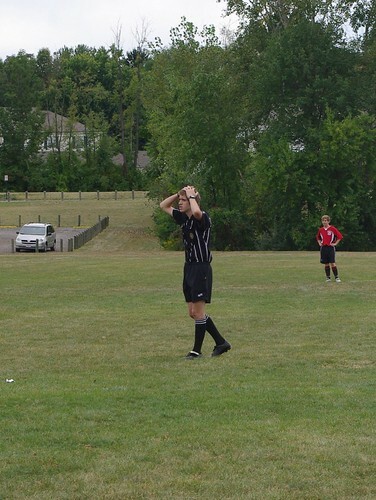 So feeling a little defeated and humiliated, Gabe sat out the spring 2012 season from reffing. Last week, I discovered that they were offering the course again at the end of the month and I quickly attempted to sign Gabe up again. When I signed in to register him the program wouldn't let me do it because they said - THAT HE HAD ALREADY PASSED THE TEST! I decided to override their system by registering him as Gabe instead of Gabriel and then I contacted the course leader to tell him what had happened and what I had done. Within an hour I had an official for Ohio Soccer contact me to tell me that yes indeed, Gabe had passed with a 75% and that they would be immediately sending out his badge! So good news for us - we don't have to waste an entire day retaking the course ( which was about 60 minutes away from home!) and Gabe can ref in the fall. The bad news is because of someone's screw up - Gabe missed the spring season reffing for Ohio Soccer and he has still never been paid for the fall season with CYO. The chances of saving for anything with soccer ref money at this rate is rather sketchy! I hope you understand that when that kid left the class in the spring of 2012 he was told that he had failed, they didn't give him a badge, and they wouldn't tell him his score. I think someone somewhere at the very least owes him an apology." He in turn forwarded that to one of the guys who actually gave the class, and this gentleman was kind of defensive. He made sure to tell me that Gabe hadn't passed the test and that his "score was so low they couldn't even coach him up to a 75%. ", and that he never showed up at the make up session. But in his bluster to put the blame on Gabe, he also admitted that they had inadvertently given the harder recert test instead of the entry level and that they lost track of who came to the make up session and so they just passed everyone! To make up for that they're sending him his badge and letting him ref in the fall. I guess that's his way of saying, "I'm sorry, we screwed up." Sam put it in perspective for me. This guy is a soccer ref. Soccer refs make bad calls. When a soccer ref makes a bad call in the field, he's still right. I guess that carries over into their real lives too.